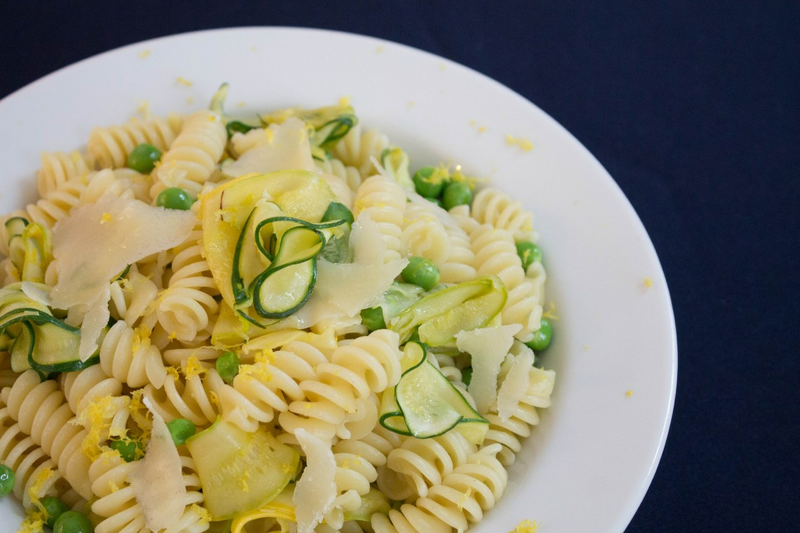 Try this recipe for a bright, clean pasta dish that features some of summer's best fresh produce. First, elegant rotini pasta is cooked perfectly al dente. Then ribbons of zucchini are quickly sauteed in olive oil along with some fresh peas just to soften. These beautiful green vegetables are removed from the heat and quickly dressed with lemon zest and lemon juice as well as seasoned with salt and pepper. The vegetables are tossed with the rotini pasta and then finished with freshly grated Parmesan cheese. It is a quick and easy vegetarian dish that is ready to serve in 30 minutes. 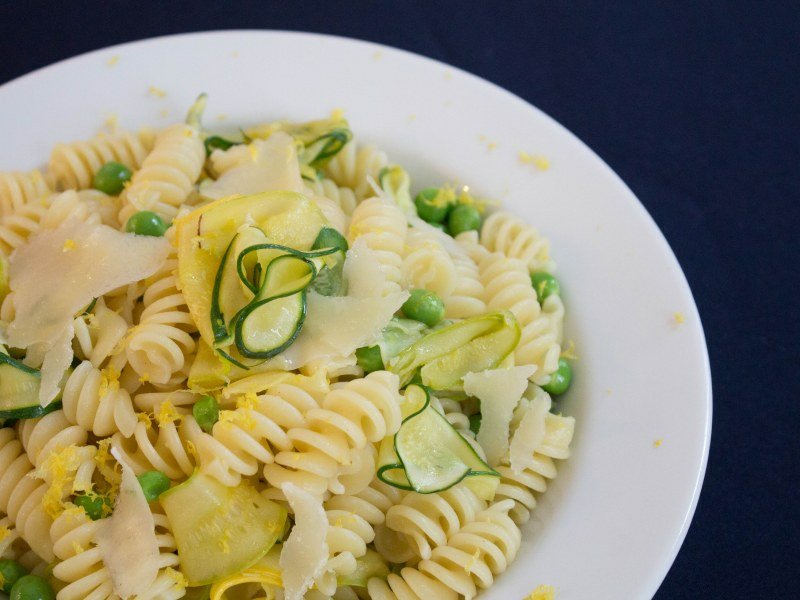 Lemon and Parmesan work well with a variety of seasonal produce. Try your favorites or whatever is ready to be harvested from your garden. Per Serving: 292 calories; 6g fat; 48.8g carbohydrates; 13g protein; 5mg cholesterol; 111mg sodium. A great quick and easy pasta dish where I was able to pull out my spiralizer since I've been going zoodle crazy lately. Very lemony and refreshing. I served this chilled - pasta salad style. Added some shrimp on top to complete the meal. Love the refreshing lemon flavor in this dish. I'll definitely be making it again. It's an easy and great side dish to serve with a simple sautéed chicken breast. Used bowtie pasta and subbed fresh peas for frozen ones. Loved how light and flavorful this turned out. Shaved parmesan on top was perfect. I made this delicious pasta and added chicken apple and cheese sausages. Definitely one of my favorite spring pasta dishes. I love how quick it was! Great spring time pasta that's a perfect dinner for two. I don't have a spiralizer so I chopped the zucchini. Also, I used frozen peas instead of fresh and it still turned out really good.